TreeTops True Stories are exciting, motivating non-fiction books which will broaden your pupils' reading experience. They are part of a structured reading programme for juniors. 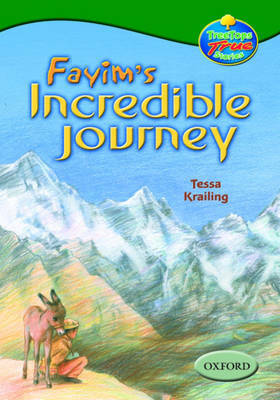 At some indeterminate time before the events of September 11th 2001, an eight-year old boy and his donkey, called Baby, make the hazardous journey from Afghanistan over the Khyber Pass to Peshawar in Pakistan. This is very much a coming-of-age tale that is based on the true story of a real little boy who did just what the story tells. In the current climate, this is a very telling narrative that is set in Taliban-controlled Afghanistan, without it being political in any sense. The story will draw children into the adventure that the boy undertakes to his new home, and help them to empathise with the courage, fortitude and determination that he shows to protect his beloved 'Baby'. Books contain inside cover notes to support children in their reading. Help with childrens reading development also available at www.oxfordowl.co.uk. This book is also available as part of a mixed pack of 6 different books or a class pack of 36 books of the same Oxford Reading Tree level.